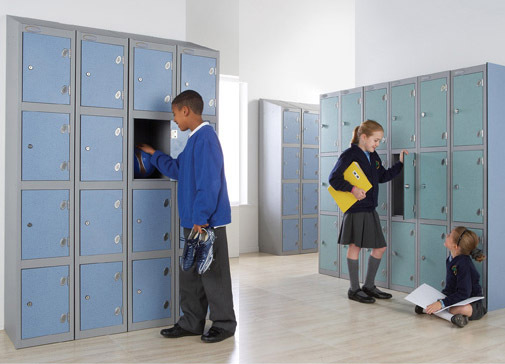 Our diverse range of storage lockers are suitable for use in schools, leisure centres, changing rooms, workplace staff rooms and retail stockrooms. 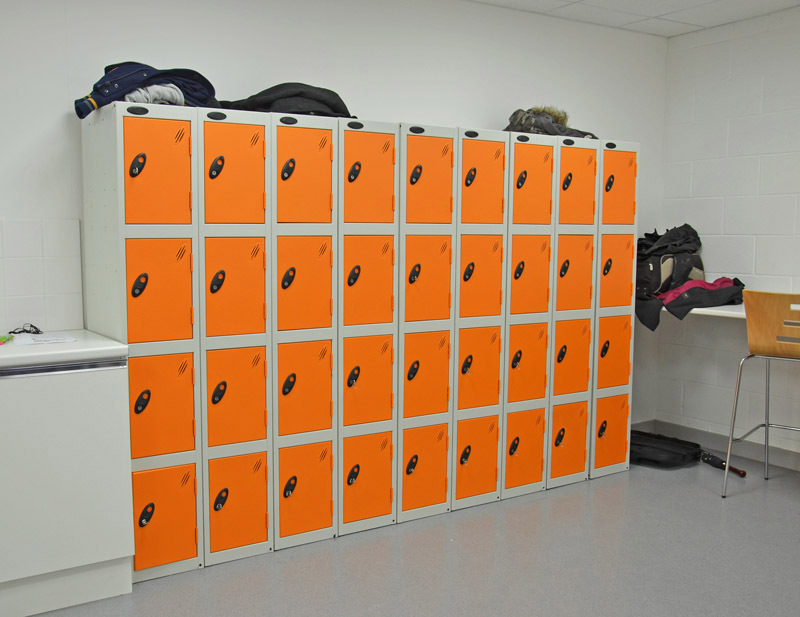 We supply only the highest standard of lockers from leading UK manufacturers to provide you with durable and cost-effective storage lockers solutions suitable for any environment. School storage lockers generally have a hard life, a steel carcass provides a sturdy and durable structure but with constant opening and closing of the doors (being slammed shut in some cases) excess strain can be placed on a standard steel door. 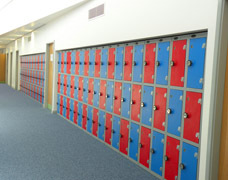 In these circumstances it is recommended that super strong, hard wearing, solid laminate doors are fitted to guard against potential damage and reduce ongoing locker maintenance costs. 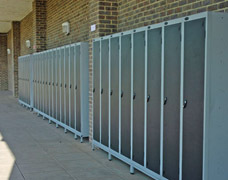 The photo (above-right) shows laminate door lockers with a variety of options including 3 and 4 tier units as well as a sloping top accessory, designed to prevent the build up of dust and debris. Anti-bacterial paint is used throughout our steel locker ranges to help reduce the spread of infections like: ASPERGILLUS NIGER, STAPHYLOCOCCUS AUREUS (MRSA Super Bug), PSEUDOMONAS AERUGINOSA, STREPTOCOCCUS & ESCHERICHIA COLI (E-coli). 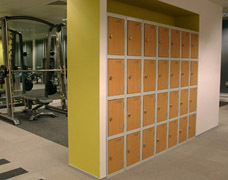 The gym lockers shown (below-right) were supplied with a solid laminate door with a wood grain finish to tie-in with the facilities fresh and modern design. 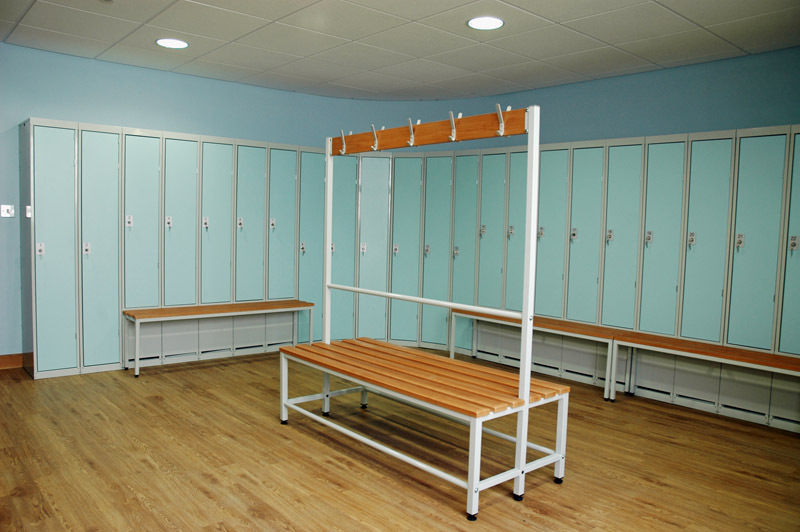 The locker units fitted perfectly within an alcove which allowed the lockers to be close at hand, this has the benefit of letting users remain close to the fitness equipment therefore increasing the time spent exercising. This solution used a locker numbering system where each door was engraved with a digit directly into the material - this negates the need to have a label or number disc, giving a permanent identification label. 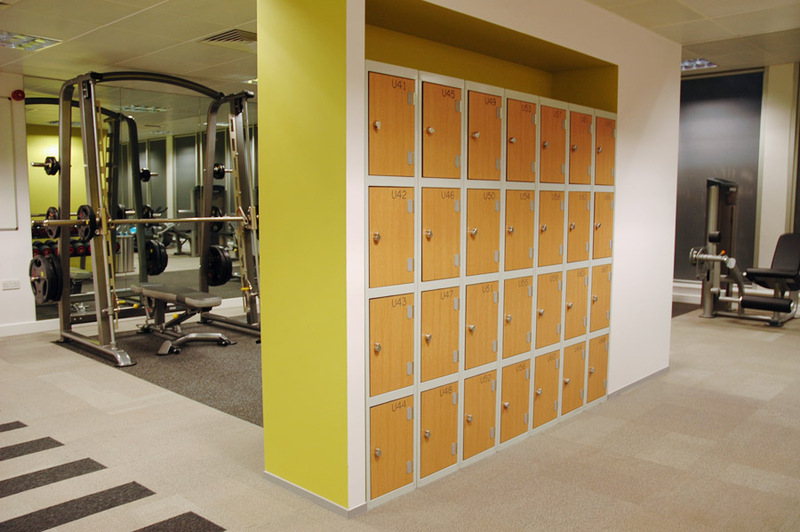 Gym locker solutions can be designed around existing fixtures and fittings or we can work with the designers and architects on new build projects. 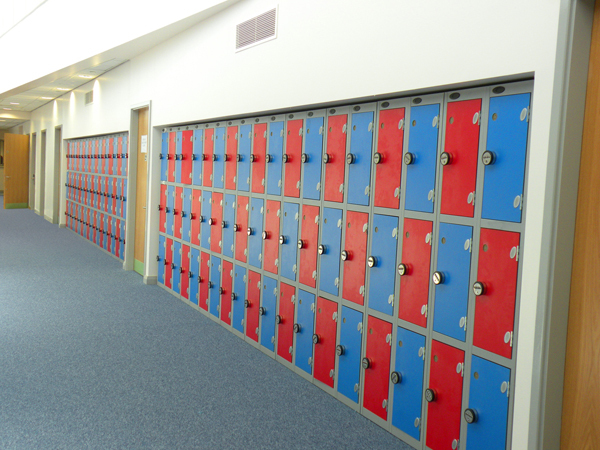 Lockers have long been a storage solution to utilise indoors but due to the demands of ever-increasing pupil numbers, schools are now looking to outside areas to increase locker storage capacity. 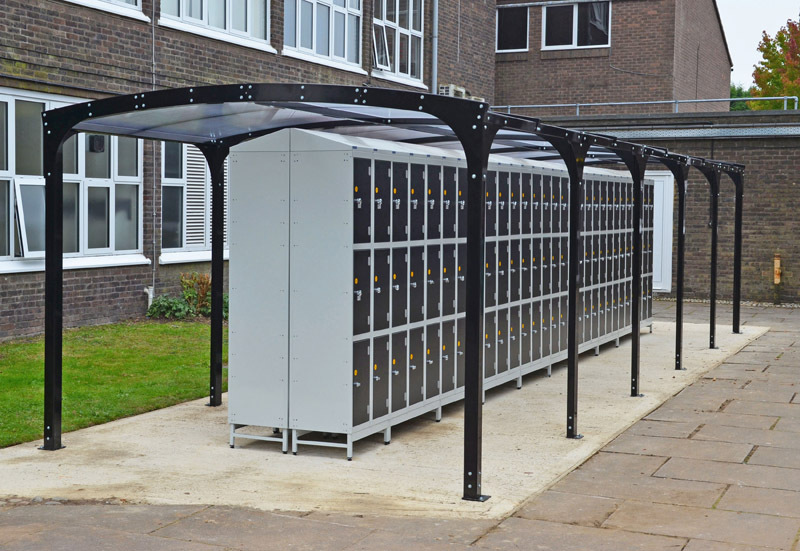 The photo (above-centre) shows one part of a large school locker installation that has made use of external covered walkways to increase the number of lockers available. 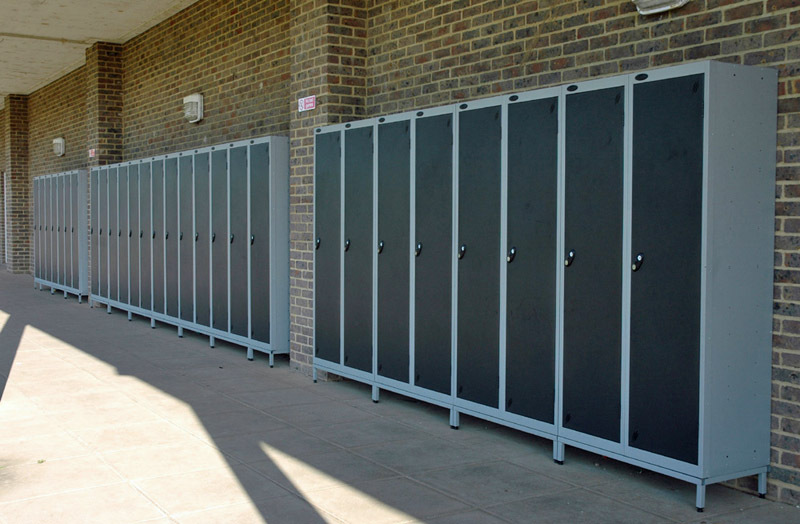 Specially coated steel lockers were used throughout this project to ensure the units were able to cope with all weather conditions. 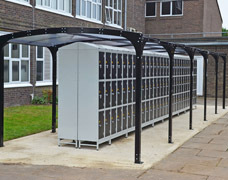 A later installation on the same site saw even more lockers installed outside but with their own free-standing canopy (see photo below-center). You can see how the lockers easily fit along what are often blank unused external walls with minimal impact to the walkway. No matter what size of school or college, we can provide the perfect storage locker solution - providing practical storage to help students manage books, clothing and other essential equipment. 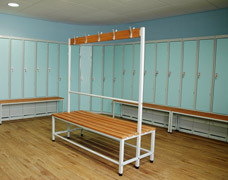 Lockers can provide useful storage in the staff room, giving workers a secure place to store their possessions during their shift. 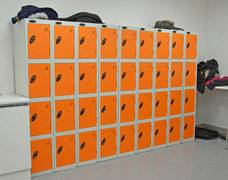 The example (above-left) shows 36 of our standard steel 4-tier lockers being used as a group of staff room lockers. This high profile retail client requested bright orange doors to match their corporate branding. There are many standard colours to choose from in our range and bespoke colour choices can be specified on larger projects if required. Contact us today to find out more about our storage locker systems, free site visits, quotes and storage locker design solutions are available.